"Sadly, with my current rate of savings I won't be able to afford the 10 grand sticker price until my kids are out of diapers and my wife and I are in them. So I decided to parody it instead." 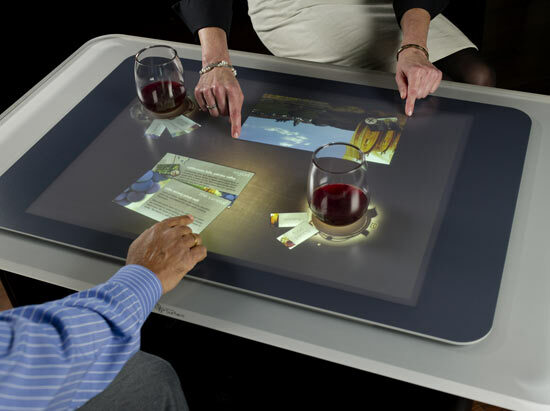 "Microsoft Surface turns an ordinary tabletop into a vibrant, interactive surface. It's the first commercially–available surface computing platform from Microsoft. The product provides effortless access to digital content through natural gestures, touch and physical objects. Today, it's a 30–inch diagonal display in a table–like form factor that's easy for individuals or multiple people to interact with in a way that feels familiar, just like in the real world. In essence, it's a surface come to life for exploring, learning, sharing, creating, buying and much more. Today Microsoft Surface is available in the retail, hospitality, automotive, banking and healthcare industries. Consumers can interact with Surface at select AT&T retail locations, at the iBar located in the Rio All Suite Hotel & Casino in Las Vegas and at select Sheratons in the U.S."